Way back before I got my license, gas was something like $2 per gallon. With gas regularly reaching and surpassing $3 per gallon in New York, I long for those $2 days. Since I recently moved out of Queens and into the wild of Long Island, there’s absolutely no way that I can avoid driving and spending quite a bit of money on gasoline. minimize my gasoline spending. if you plan on hitting the road this summer, you may find these tips for saving money on gasoline useful. The first one is simple: quit driving so much! When you’re not driving you are saving money on gasoline. I don’t drive to the bus stop, instead, I walk. I’ve even been known to walk to the local supermarket and back if I’m just picking up a few things. Okay, it’s 5 blocks away, but those are some pretty long blocks. I hear that whole walking thing is good for your health too. When driving, slow down. Your lead foot is costing you more than you think. I know that a 60 mile per hour speed limit is cramping your style, but it appears that the government has done its homework and found that for every mile that you drive above 60, you use more gas. Now, I’ve been known to speed a time or two when racing to catch the train but I don’t advise you to do the same thing. Be a consistent driver. Please don’t be like my husband and peel off then jam your foot on the brakes to stop. Such erratic driving costs you money in the form of gas. Well, it’s costing HIM anyway. Plus, you put less wear and tear on your car and tires. Do you know how much a decent set of tires cost these days? Since you’re maintaining your tires, you might as well maintain your car. This means new spark plugs, air filters, oil change and the like. Check your car’s handbook to see the recommended maintenance schedule. I know that this will cost money, but it’ll make your car last longer in the end and it’ll help you save money on your fuel costs right now. Typically this will improve your fuel economy by up to 4% but major issues such as a faulty oxygen sensor can cost you a whopping 40% in fuel economy. Ditch all the extra stuff in your car. If you are hauling your kids’ stuff and lots of extra things, you are slowing your car down. I would get rid of the spare tire if I could, but the husband won’t let me. The lighter your car is the less gas you use. Live in a warm climate? Park in the shade. Gas expands and evaporates which means that you will be losing some of it in the heat. I know that this one sounds like an urban legend, but trust me on this one. Now, hold on to that trust for the next one. Don’t fill up your car during the hottest time of the day or right after a gas tanker delivery either. Just as it does in your tank, gas expands in the storage tank at the gas station too. In fact, they put additives in the gas during the summer. Don’t buy gas between 1pm and 4pm if you can avoid it because that tends to be the hottest part of the day. Also, if the oil tanker just made a delivery, pouring all that new gasoline in the storage tanks stirs up debris and sedatives that might be sitting in the bottom of the storage tank. You don’t want that in your gas tank, so wait! It’s been cold here and I’m guilty of this one, so I’m almost ashamed to tell you to not leave your car idling or “warming up” for too long. I’ll admit that I stand inside and hit the auto start waiting for the car to get nice and toasty and for my seat warmers to heat up to the perfect temperature for my backside, but I’m wasting gas! It’s going at the rate of something like one quart for every 15 minutes. I can wear another scarf and quit the idling. Take your foot off the gas and coast for a bit. This is especially true if you’re driving up to a red light or going downhill. It makes no sense to me to speed my way to a red light or down a hill. While we’re at it, there’s a function in your car called “cruise control”. It’s totally old school, but if you’re doing some long distance driving, set it and forget it. It’ll help you save money too. 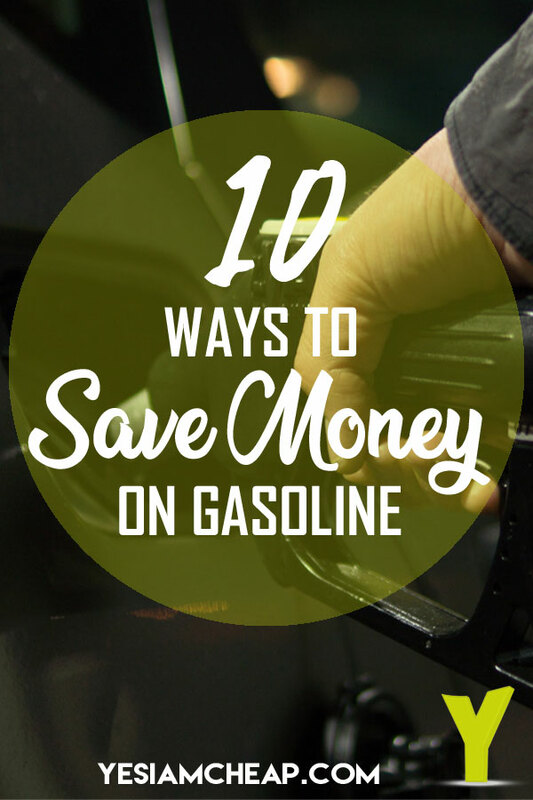 There are, of course, more ways to save money on gas, but these are pretty painless and easy to implement. If you’re in the market for a new car consider paying attention to gas mileage or think about buying a car with a manual transmission. Cars that run on diesel gas have also been known to help you save money. Do you use any of these techniques? Have you noticed any improvement in the amount of gas that you use? This entry was posted in Save Money and tagged gas, save money. Bookmark the permalink. Thanks for the tips. One more you can add is (or is a variation of #10) is to go on neutral when going down a slope. It not only saves you a lot of gas, but also avoids the risk of losing control of your vehicle. I make a to and fro journey to hillside as daily commute and do this every day. Saved a couple hundred dollars annually on gas this way. For those that can manage their credit well, using a card that rewards gas purchases can be another saving. It’s easy to find ones that give 2 or 3 percent cash back and occasionally you find better (Chase freedom card is giving back 5% this quarter for the first 1500 spent). If you’re not paying it off in full monthly, it’s a loss as the interest is higher, but if you pay it off in full every month it brings down your fuel cost.